Finally, a new lesson! I call this one, Flamingos Napping. If you would like to follow along with this lesson, go to my online etsy shop, www.watercolorgirl.etsy.com, click the icon for online class and complete the five dollar purchase. You will then receive an email with the drawings and reference photos for this lesson! Transfer the drawing to your paper. 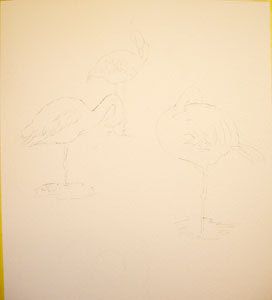 With this lesson you will receive several sketches of flamingos in different sizes. Do some thumbnail sketches to see how you might like to arrange them. You can enlarge or shrink the drawings provided to fit your composition better. Once you have a nice composition, transfer the drawings to your watercolor paper. After you transfer your drawings, use masking tape to secure your paper to a foam core board.